September/October is my favourite time of the year. It is (usually) the perfect weather as Spring starts and love is in the air with engagements and weddings! Here is the fabulous Paul and Abby at their engagement last weekend! The house was decked in purple and white with tea candles everywhere! 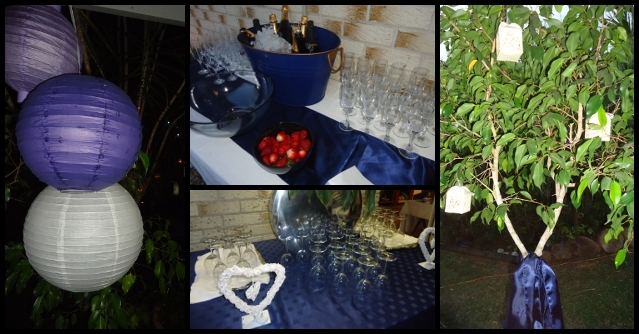 I loved the champers and fresh strawberries! Ooh I love the blue dress! Gorgeous party, gorgeous you always. looks like fun! you looks great! what a big, happy, open and nice smile you have!!!! Cheers! Looks like another great night out with friends! Champers + Strawberries = winning! what a great blog you have!! i really love the print on your outfit. looks super cute and the coat you wore with it is just fab. The floral print dress is great. The colors are some of my favorites and the shape is really flattering. Congrats to your girl! That blue dress is amazing!!! you look beyooootiful! I love the cut and color of that dress on you! So gorgeous! Beautiful. Love you in that floral dress and earrings are simply stunning, so so cute <3 them. Aww, what a cute engagement party. I've been engaged for a year and have yet to throw together an engagement party. Booo at me! You and your friends are all so gorgeous and I love all your dresses - so pretty. Congrats to your friend and well wishes.